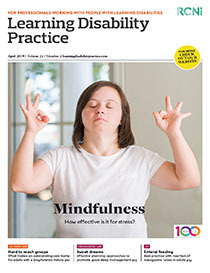 Aim To evaluate the effect of a 12-week mindfulness-based stress reduction (MBSR) course adapted for people with an intellectual disability (ID). Methods Ten participants with ID completed measures of well-being and understanding of the concepts of mindfulness before and after the course, provided information about additional practice and gave feedback on the perceived benefits of the course. Findings No significant difference was found between mean well-being or understanding scores before and after the course. A significant relationship was found between additional practice and post-course well-being scores. Perceived benefits of mindfulness included reduced stress, increased self-control and confidence. Conclusion MBSR may be effective for people with ID but the benefits may not always be reflected in changes in questionnaire scores. The amount of practice of mindfulness exercises may be an important component of increasing well-being.